Steinman which explores the history and modern day existance of jazz in india. During our time in New York we had the pleasure of being invited to participate in the highly rewarding Docuclub, a program run by filmmaker Felix Endara in association with Arts Engine www.artsengine.net. Once a month a filmmaker is selected to have their film shown amongst an audience of documentary makers, critics and general enthusiasts of either the genre itself or the subject of the chosen film. Acceptance of the film is based on the premise that it is just prior to it's final edit, and thus the purpose of the club is to create a platform for critique and constructive criticism to hopefully help guide the film to it's completion. A carefully selected and well established mediator then accompanies the filmmaker at the end to direct the discussion. We felt extremely grateful to take part in a few of these sessions as we know all too well the struggles of post production and the often inward turmoil, especially for those working alone. To have that audience with a set of fresh and unbiased eyes is such a integral and beneficiary experience , yet one that somehow despite the simplicity in it's art or film school crit like structure doesn't happen nearly enough. Often actually due to not knowing how to independently house this space and drum up the right interest. Docuclub therefore does something highly valuable and much needed by bridging that gap between often going from all (the communal space of an institution) to nothing (the lone independent filmmaker) and allows a unique space in which to be able to voice problems, ask advice and share feedback and experiences in that often crucial stage. So for anyone living in or visiting New York City, we highly recommend checking out their website www.docuclub.org and possibly trying to make it to a screening or even submitting your own film. 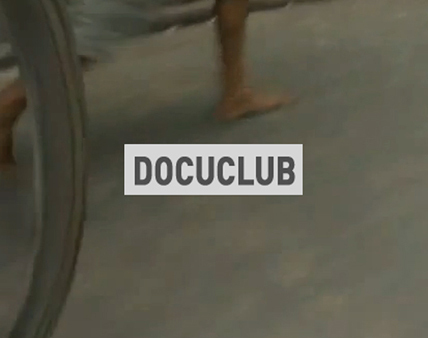 GuerillaDocs is also extremely excited to announce that we are currently working on bringing the club to both Berlin and London in association with Docuclub itself. Please keep checking back on the latest information regarding this and do let us know if you have a film that you feel could fit this idea and that you think the club could help with. Otherwise later when we have established more, we will be creating an open call.